While I got the book Destination Work, published in India by Westland in 2010, by Harry Paul & Ross Reck few weeks back, I learnt Harry Paul has written another book titled Fish earlier and that book was there in my wishlist as well as in my reading list, however I had not read it fully. So I thought before Destination Work, I should finish Fish and then go to destination work, so I took Fish and finished it in two long sittings. My review of this book is here. The book starts with its dedication to millions of workers who relish the thought of having a more playfully productive atmosphere at work and a foreword by none other than Ken Blanchard (of The One Minute Manager fame). It is a story of an organization called First Guarantee Financial situated at Seattle. Mary Jane loses her husband (Dan) who was working in another organization, she has two children, a son and a daughter, the workplace which has been termed as The Toxic Energy Dump (TTED) situated at the Third Floor. There is an indication that if they do not improve their work, they might lose their work to an outsider agency. The security of the people working there is at stake and they are just carrying on the activities without any motivation and with no mindset to take initiative to change the working pattern, system and methods. Mary has started getting frustrated ("Does my staff know that the security they cherish might be just an illusion? Do they realize the extent to which market forces are reshaping this industry? Do they understand that we will all need to change in order for this company to compete in a rapidly consolidating financial services market? Are they aware that if we do'nt change we will eventually find ourselves looking for other employment? 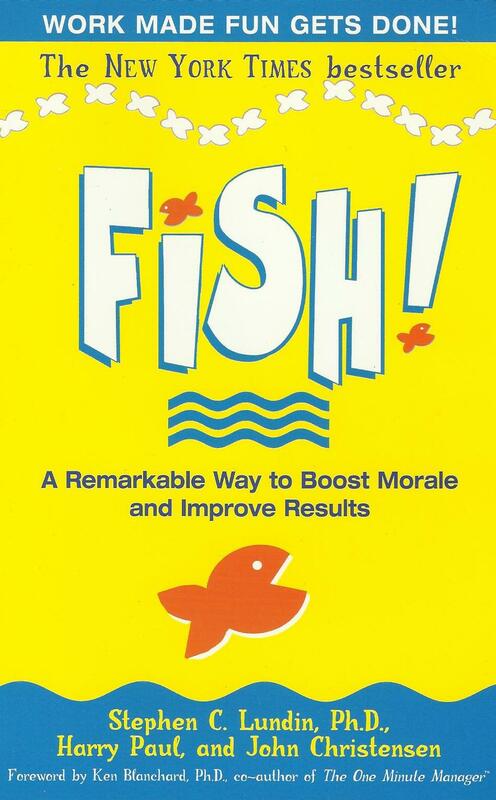 "p 23) till one day when she visits the world famous Pike Place Fish market (PPFM), where she learns the basic lessons of dealing with people and processes and it boosts her morale to take initiative and to introduce her colleagues and subordinates to a totally new work environment. She maintains a journal where she keeps jotting down her thinking and learning which gets consolidated at the end of the book apart from its mention in pieces here and there. She is convinced about the view that everyone in the organization has to put extra effort in order to impress leadership about their competence, however the energy level and the morale of the employees in the department is touching all time low. Her boss has termed the department as TTED and when she communicates this to others, they feel further demotivated and they have lost all enthusiasm to perform better and are planning for a better place to work elsewhere. One day Mary visits the work famous PPFM, which changes all her opinions, views and thinking which motivates her to transform the third floor and to convert TTED into a great work place where everybody enjoys working. She is able to find a huge set of energy, enthusiasm, involvement and engagement at the fish market where the shopkeepers are adding lot of fun to there work and enjoying every bit of what they are doing. These reflections drives her to the fish market many times and one day she gets successful in bringing all her team members to this market amidst individuals who, much against their will, are visiting the market. At the end she succeeds in using her learning at the fish market at the third floor which transforms everybody there and the workplace becomes a great sharing space for everybody. Find a message that communicates the notion of choosing your attitude in a way that everyone will understand and personalize. 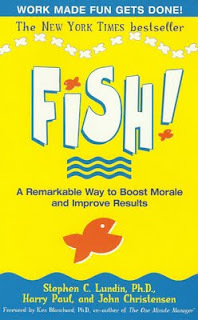 I suggest this book for each one of them who get disheartened at the workplace by looking at the highly demotivated workforce, for each one of them who think small things do not matter in big organizations, for each one of them who believes that the thought of positivity throws away all negativities, for each one of them who has strong faith and belief in oneself. I know I made a better choice by reading Fish before Destination work on which I jump now. I lived the poster part the most ..